everything you want is within reach. your life is in other people's hands. Close more deals. Command more wealth. Earn more respect. Win more sales. Let’s face it… two of the most important things in life are relationships and financial security. The latter relies on the former. Every penny you’ll ever earn will come through another person. Every joyful memory you’ll ever have will be because of another person. Every important goal you shoot for involves one or more people. The truth is, people do make your “world go ’round.” Consequently, one of the most important skills you can ever learn is to influence others so that everyone wins. And learning to influence others so they win and you win is one of the most uplifting, life-fulfilling, confidence-building feelings you can ever have! While you certainly have control over what you accomplish in your life, there’s no mistaking that your boss, coworkers, clients, friends, and family can determine whether you get there or not. Bottom line: Becoming an “influencer” is one of the most important skills, if not THE most important, you can develop. It was backed by research that people align themselves with influencers. Played out again and again for a research association in San Francisco, it was documented that if you can communicate calmly, comfortably, and with confidence with a complete stranger, that stranger’s heart rate will match yours within a few minutes of talking. These researchers found that regardless of the initial varying heart rates of two people talking, after a brief encounter, their heart rates were nearly identical. in the course of your life! Let's start by putting to rest a few misconceptions about influence. It's not about manipulation or anything sneaky and deceptive. It's not smooth talking or salesmanship. It's simply the most powerful tool at our disposal to elevate human potential. More than charisma. More than being a leader or an authority. When you master the rarely used, yet powerful craft of influence, you gain the foundational skill that amplifies all other skills. You will bring your boss, co-workers, and family to your way of thinking. You will enhance your ability to negotiate, communicate, and close deals. You will gain respect and a prestige that's unmatched. You will make friends and valuable connections quickly and easily. You will increase your chances of achieving your most important goals. In short, simply mastering this one skillset gives you a sizeable advantage in the eyes of your colleagues, clients, friends, and family. The benefits of being able to influence yourself and others are profound and widespread. Unfortunately, practically nobody teaches this skillset in the manner you need to bring significant change. While many businesspeople can speak on the subject of influence for an hour or so, Robert Pino has immersed himself in the craft of influence for the past 20 years. As an executive coach and adviser to business and political leaders, Robert has not only examined every scientific layer of influence, he has personally applied it to his own personal and professional life. As a result, Robert has multiple degrees, has founded his own strategy consulting firm, has won several prestigious awards, and even finds time to excel in the martial arts of Aikido and Karate. Appearing on CNN, ABC, NBC, and MSNBC and consulting for leading companies such as Coca-Cola, Nestlé, Philips, Heineken, Sara Lee, and British Petroleum, Robert has used his influence to bring extraordinary results to everything he touches. Robert Pino reviewed reams of scientific research and studied dozens of advanced psychological techniques to reach the most advanced application of influence — his 24 Laws of Influence. More than ideas or suggestions, these are ironclad laws that when put into action… simply WORK. These 24 Laws are proven methods of power and control used by winning politicians, successful negotiators, and leading businesspeople, as well as celebrities all over the world. Plus, every day, in every personal and professional interaction, Robert uses his 24 Laws himself. Now he's ready to share his model for master influence and all 24 Laws with YOU. From dealing with teenagers to influencing your boss to give you a raise to negotiating a landmark deal, Robert Pino's Nightingale-Conant program, The 24 Laws of Influence: Unlock the Secrets of Truly Charismatic People, gives you the proven instruction, motivation, and leverage you need to stay in control. With one powerful technique after another presented in an almost hypnotic approach, Robert teaches you how to apply the 24 Laws in every situation you face. These 24 Laws become your achievement toolbox, giving you an unmistakable advantage in most every encounter. When your co-workers try to convince you of their ideas and prejudices, deflect their influence with one of the laws. When you wish to influence the decision of your friends or family, use a combination of the laws to gain an even stronger foothold. As you listen and begin to master these laws, your mind creates a whole holographic representation of how the other person is trying to influence you and how you can best influence the other person. Consciously and unconsciously, your mind considers the person's words, body language, and intent and instantly reminds you of your best course of action. In the beginning, it takes a little practice. But once you master the craft of influence, you'll automatically use the laws unconsciously in work and play! From that point forward, whether you're in the corporate boardroom, at the family dinner table, or sitting across from your boss, you'll have a secret weapon that will enable you to take charge of your thoughts, decisions, and actions! 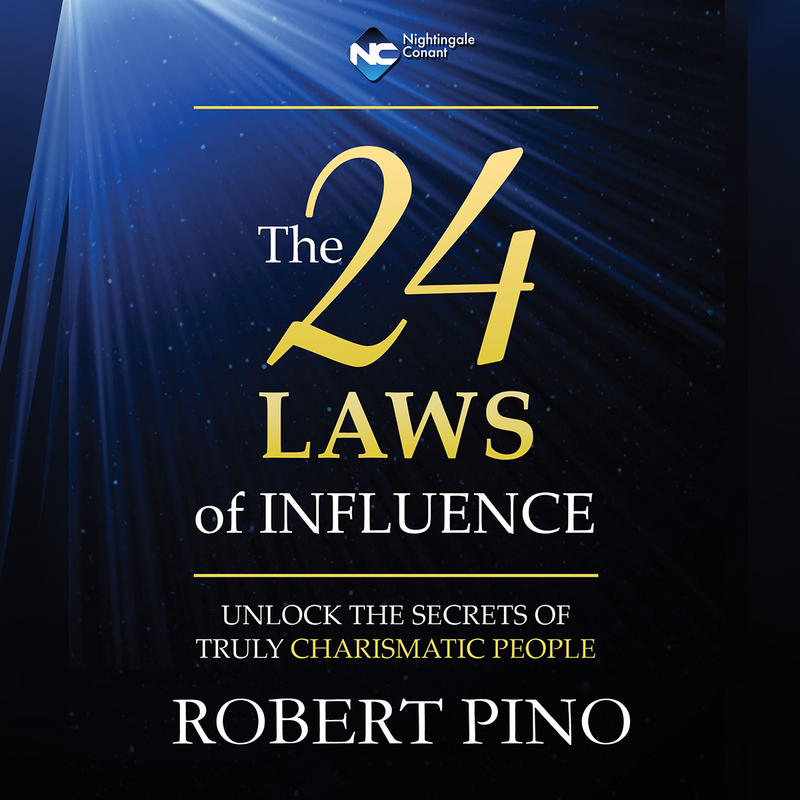 Throughout the 6 original CDs and writable workbook of The 24 Laws of Influence, Robert will teach you the 24 Laws that will not only strengthen and expand your influence, but enable you to instantly identify and deflect the influence of others. How to automatically influence others by using all THREE of your minds. Always make the correct judgment as you influence without effort by using your ego, conscious, and subconscious minds. The secret to achieving the right level of charisma that magically draws people to you. Greet someone while in the wrong emotional state, and your influence weakens. Yet, discover this rare and magnificent energy field, and you'll win people over in just one four-second handshake! How to stop committing slow-motion suicide. There is one activity most all of us have engaged in that weakens the body and psyche to the extent that it invites devastating diseases. Whether you do it to yourself or others, it's just as damaging. Learn to avoid it at all costs. The 4 elements to become a more charismatic person. Once you live by these 4 essential elements, your whole being becomes aligned as you gain an unmistakable advantage to achieve all your goals. How to identify the nonverbal cues that reveal you are being LIED to. You'll learn to instantly spot these discreet actions that inadvertently give away their secrets and are almost as accurate as a lie detector. These work! Use them on your children, your spouse, your boss, or your clients… and gain the upper hand. How to use the power of visualization to influence the very results you envision. It's a rare class of people who can influence the precise outcome they visualized. You'll learn a 3-step process to do just that! How to trigger your mind's power of manifestation. Beyond hope and desire, your mind holds the power to manifest what you want most. Robert reveals this little-known secret. How to avoid making the all-too-common mistake of mirroring someone. You may have learned that in order to influence your boss or a client you should mirror his or her actions and habits. Not only does this not work, the person may actually think less of you. Rather, THIS is what you should do! How to confidently win more sales and close more deals! Robert teaches you the invaluable Value Circle approach to sales. Use it regularly, and price will no longer be an objection. The REAL key to negotiating. If you are looking to win each negotiation, you rarely will. Robert reveals how to get everything you want while looking out for your opponent's interests as well. Just how far can influence take you? Just ask any celebrity or high level executive. The world is filled with influential people. The magic of their power and pull rests in these 24 Laws of influence. Now, you can experience a massive rise in fame by using these same laws. That's the power these laws hold. Suddenly you become acutely aware of anyone trying to influence the way you think, act, or feel. Even more, you begin to get your most important points across to your boss and co-workers. You bring others to your way of thinking. You suddenly connect better with your spouse and kids. Remember: Influence is the most powerful skill you can have. It creates the outcomes, relationships, career, and monetary rewards you seek. And it amplifies every other professional and social skill you need to be successful. I look forward to learning about how it has opened up new opportunities throughout your life. P.S. If you've ever purchased a wealth-building, career-enhancing, or personal development program from Nightingale-Conant, The 24 Laws of Influence will have DOUBLE the impact for you! Because once you listen and start influencing those around you, you'll begin to see more of the results that those other programs promised. I want to gain the awesome power of influence to elevate my personal and professional potential. I’ll be able to identify and deflect influence from others, influence those around me, and influence my own results. Please send me Robert Pino's audio program The 24 Laws of Influence, at the special price below. - I can select one of two ways of ordering.